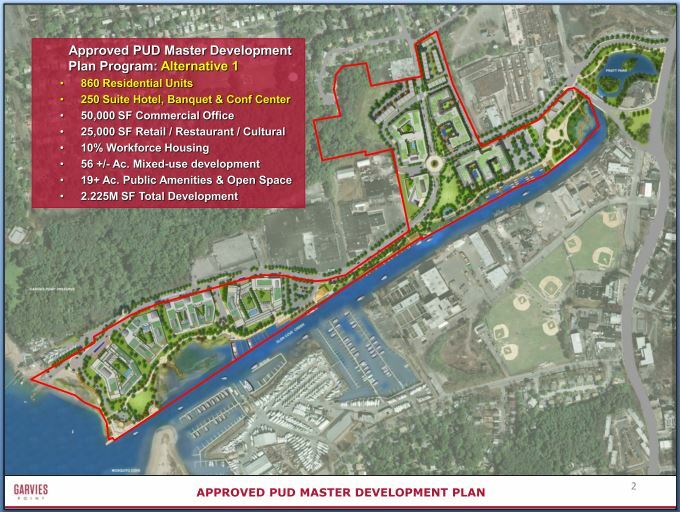 July 25, 2015 -- The developer who in late 2011 had received approval from the Glen Cove Planning Board to build a planned mixed use community with 860 residential units known as Garvies Point (formerly Glen Isle) on a 56 acre site and former brownfield along the northern waterfront of Glen Cove creek, returned to that same board for a public hearing this past Tuesday evening to present amendments to the original plan that will increase the number of housing units to 1100. RXR, the construction, development, and real estate firm whose large scale luxury residential projects include the Ritz Carleton Condominiums in North Hills (on the eastbound LIE Service Road at exit 34), maintains that the amended Garvies Point proposal is an improvement over the original as it would significantly reduce the overall amount of square footage of the buildings, create more green space and be more environmentally friendly while at the same time being more economically viable - points also made in separate resolutions adopted by the City of Glen Cove’s Community Development and Industrial Development Agencies in late June in which each gave its stamp of approval to the proposed changes. The original approved plan includes four large residential buildings stretching from the western edge of Glen Cove Creek, adjacent to the Hempstead Harbor Yacht Club, to the Glen Cove ferry terminal, with twelve story residential buildings bookending four and five story structures, one of which would be a 215 room hotel with a convention center. An esplanade, running 1.1 miles from the mouth of the creek to its eastern end would connect the residential buildings, hotel and convention center to retail stores, services and amenities providers, and other new commercial development on the eastern side of the ferry terminal. The amended proposal preserves the esplanade and commercial development of the original, but greatly alters the residential section. The hotel and convention center have been eliminated and the twelve story building (125 feet) at the western edge of the property has been expanded from 518,000 square feet to 730,000, and the eastern-most residential building has been cut down from 12 stories to five, but with a larger foot print. Overall the square footage of the buildings has been reduced from 2.1 million square feet to 1.8 million, and while the hotel has been eliminated the number of residential units has been expanded from 860 to 1100. A large three acre green lawn would now separate the two buildings. (see images to the right). The amount of green space included in the project would be increased from 47.6% of the property to 52%. Additionally, the marinas included in the approved proposal that would have been able to accomodate large vessels (those too big to be transported by trailers along roadways) and that overall could accommodate 85 boats, will now only be able to accommodate small vessels but with the number of boat slips increasing to 120. 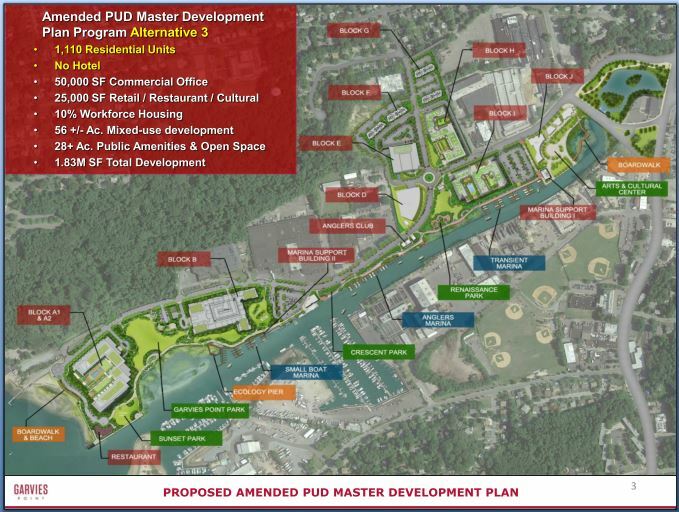 According to the approval document issued by the Glen Cove Community Development Agency (CDA), the change, the agency said, is preferable to the original plan as it would require less dredging. The new proposal also shortens the length of an "ecology pier" included in the original plan thus reducing disturbance to wetlands. According to the CDA document, the alternative plan presented this past Tuesday had already undergone a SEQRA review (State mandated environmental impact study) at the time the original proposal was put forward, and that the Planning Board's statement of finding issued in December 2011 had concluded that the alternative plan "would not result in any significant adverse environmental impacts." This past Tuesday the planning board took no action on the proposal, and residents and interested parties will continue to have the opportunity to submit comments. Mayor Bruce Kennedy of Sea Cliff, who attended Tuesday’s meeting, said to Northwordnews a few days later that the Village of Sea Cliff Board of Trustees had not yet taken a position as to whether the amended proposal is preferable to that which had already been approved a few years ago. He said the Board would discuss it, and then would submit comments to the Glen Cove Planning Board. The Mayor explained that he recognized that the new development would help offset the cost of the clean-up of a waterfront that was once among the most polluted in the region, and that perhaps many businesses in Glen Cove and the surrounding area would benefit, but was concerned about both the impact the project would have on the vista one enjoys from Sea Cliff's waterfront as well as the traffic resulting from the influx of 2500 or more residents to a section of Glen Cove that borders the village. He said he believed the infrastructure of Glen Cove and surrounding areas, in particular the roadways, are inadequate to accommodate the population growth resulting from the development, especially with other development proposals being considered such as the Villa Project on Glen Cove Avenue. As for the more expansive twelve story, 125 foot structure that will no doubt draw a Sea Cliff stroller’s, swimmer’s or sailor’s disapproving stare, or that of a resident whose home overlooks the harbor, Mayor Kennedy wondered if the developers couldn't build a slurry wall and lower the parking garage underground rather than having it occupy the first three floors, thus reducing the building's height by three stories. 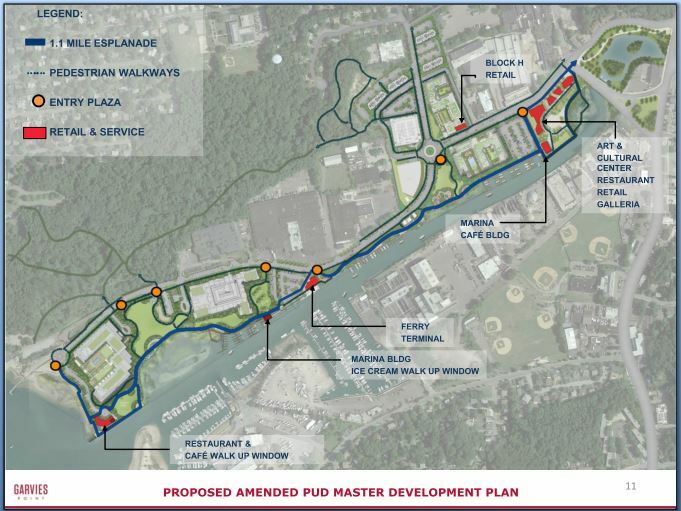 The residential portion of the development would be located at the southwesten end of Glen Cove Creek and most of the retail at the eastern edge with a 1.1 mile esplanade connecting the two. 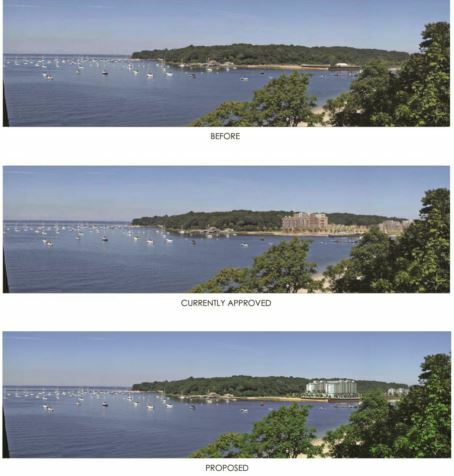 The top image shows an RXR artists rendering of the Glen Isle project as approved by the Glen Cove Planning Board in 2011. The bottom shows the amended proposal that was presented this past Tuesday night. Both have 12 story (125 feet) structures at the southwestern edge of Glen Cove Creek. In the amended proposal the structure is more than 40% larger in terms of square footage. Middle - An RXR artists' rendering of the 12 story, 518,000 square foot building, with four and five story buildings to the east and a second 12 story building to the far east, that was approved by the Glen Cove Planning Board in 2012. That project would include 860 condominium units, a hotel with 250 rooms and a convention center. Bottom - An RXR artist's rendering of the 12 story, 730,400 square foot building that RXR is seeking approval to build, as part of its amended proposal. That building and the smaller five story building to the right would contain 1100 condominium units. The convention center and hotel have been eliminated. The documents accompanying RXR's application for approval of its amended master plan for Garvies Point /Glen Isle can be found by CLICKING HERE. RXR's Glen Isle website which offers a general overview of the project can be found HERE. The left image shows the Glen Isle project as approved by the Glen Cove Planning Board in 2012. The right shows the amended proposal that was presented this past Tuesday night.